The Robidoux "Quick'n'Dirty" rolled out neutral from just below the towering Scotts Bluff National Monument this morning. This landmark on the Oregon Trail marked the end of the Great Plains and the beginning of the foothills to the Rocky Mountains. Things were calm and stayed together for about 3 miles. @1stcitycycling had four on the startline today. James and I made the early split of 5 and pulled open a gap on the early flat-ish sections. They also happened to be the only tailwind sections of the day. Our group of five split on the first steep climb of the day. I found myself in no-mans land and didn't want to push too hard too early… It took almost 6 miles for parts of it to regroup, two bridging up from the chase back made five again, with two more including James forming a break ahead. While 'The Monument' really steals the show in the valley there were cool little rock outcroppings all along the route today. Generally pretty fast gravel roads, which is my preference considering I was on 32mm CX rubber and not super chubby 42mm file treads like many of the others. Met a cool dude Todd from Kearney who needed to make sure I gave @your_group_ride his best. After about 25 miles of racing we got to do a flyby of Scotts Bluff on the south side, pretty great view to distract the legs on the climb. Organizers gained access to use this great little connection road along the edge of the valley for a bit. Challenged the cornering-in-dust skills a bit, also picked up some goatheads. My tubeless self-sealed after spraying Stans all over the place for a few revolutions of the wheel. One other from Lincoln NB wasn't quite so lucky. The course took us up the Carter Canyon to Robidoux Pass. The road pitched up to 12ish percent near the finish and we were treated to a very fast sweeping descent off the other side. My GoPro started to get coated with something here, no surprise really, we were doing 40 mph in the dirt! We had regrouped and split again down to five and had some non-contributors and so I made a bid to split the group at 25 miles to go. I didn't have the gumption to make it stick and decided I need to try and get some calories into my stomach so I could try again later. Easier said than done as I had rolled past the 11 hour mark on the weekend and had really started to lose interest in lukewarm snacks from my jersey pockets. After our group generally called a truce on the Rifle Sight Pass we looped 'round for the final climb this time right up and over the paved road through the monument. I went to the front and put down the best 5 minutes of effort I had and was very pleased that I arrived at the top sooner than expected and with a sizeable gap on the next man. The finale was up this great tree-Iined lane and around the cemetery before plunging through a crazy washout and over to the park. I had just enough seconds in hand to really enjoy the finish. Didn't think I had much of a chance today, but just tried to ride smart and conserve energy where I could, and go fast where I felt like it wouldn't cost me too much. In the end, everyone was exhausted, my winning move was probably something like 400 watts for 3 minutes, but when everyone has a thumb to their chin that's all it really takes. Not a whole lot of bike races I've ever done see their outcomes decided like that. Gravel racing is pretty sweet stuff. Rattlesnake Rally west of Casper Wyoming today. 120 mile loop 'round Rattlesnake mountain. James and I represented @1stcitycycling. No @noosayoghurt cows were seen today, only their beefy-brethren. 7am rollout, acceptable in only very specific cases: going to be riding your bike for longer than an entire workday qualifies as one of them. They move of the day included Tour Divide record holder Jay Petervary. Some people think he's a cool cat. When I told him I was feeling like I had a bonk coming on at the 105 mile mark he told me "dude, just forcefeed yourself" Apparently that's how you ride from Banff to Mexico in less than 16 days. Race started with a 45 mile climb up over Rattlesnake pass. Only saw one rattlesnake today. I was in the initial move of 4 but got separated on a climb at mile 20 and faced the headwinds alone. Topped out at nearly 2300m elevation, but Mother nature made sure we didn't run out of oxygen by blowing a 25 mph headwind right into our mouths. After 90 miles of headwind the course turned onto the Oregon Trail and headed for home, finally the wind was from behind. Unfortunately I didn't have a whole lot in reserve at that point to make much of a push for the final 30 miles. Pretty great skies on the run-in to the finish. 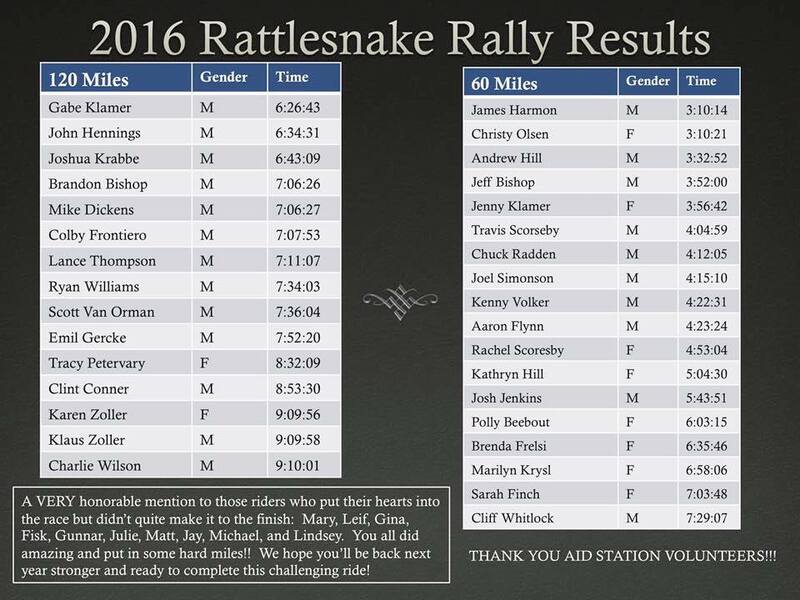 I wound up third overall, estimated to be twice as tough as last week's race. Again set a record for longest day on the bike (this time my TCX).